Well, you’ve gone and done it again. It seems like just yesterday we reached 100 million lessons delivered, and now we’re currently on pace to reach 200 Million. This is a remarkable feat! So what does 200 million lessons mean, anyway? Note: this is just the running time of our audio and video lessons, and doesn’t include time spent on applications, website usage, Audiobooks, iBooks, and all of our other products. So how remarkable are these numbers? How many teachers would it take to deliver the same amount of lessons? 3,786.6 teachers working 5 years (about the same amount of time we’ve been in business). Of course, this is in NO way a knock at teachers. We have the utmost respect for educators. We’re educators too! We feel our service complements the service teachers and tutors provide. It’s a testament to the power of combining technology with the passion of a small number. InnovativeLanguage.com started with 1 person (me) and now employs about 25 full-time people and a small army of part-time workers and contractors spanning over 25 languages. Over the lifetime of the company (around 5 years), products have been created, designed, recorded, edited and published by just a few hundred passionate people. We’re a small team looking to deliver big things. Over the next few months, leading up to the 200 million milestone, I’ll be sharing more news and stories from behind the scenes at InnovativeLanguage.com to celebrate just what we do here. Thank you again, to every single listener out there that has downloaded, subscribed and joined in on our passionate language learning community! Today, we bring you a blog post from Motoko, JapanesePod101.com lesson creator, host and InnovativeLanguage.com Office Party Planner! Motoko will be sharing more posts on our blog, so check back often and leave a comment! 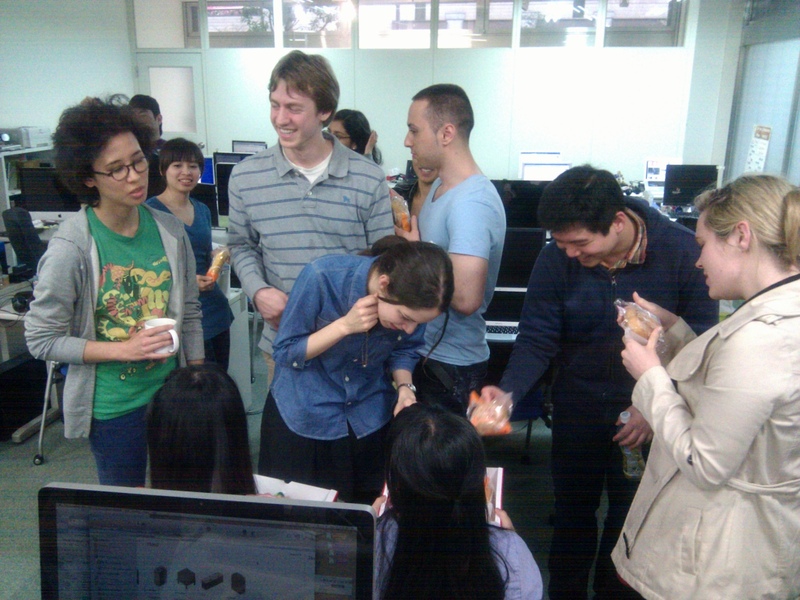 On the 17th of April here at Innovative Language Learning, we had an afternoon tea party. Although Kim (a member of our Business Development Team) moved to Hong Kong, last week she came back to Japan for a brief visit, so it was her ‘welcome back’ party. Meanwhile, Pim (host of ThaiPod101.com) is going back to her home country to have her baby, so it was her ‘farewell’ party. We all ate pastries, chatted, and enjoyed ourselves. There was a choice of pastries: strawberry, green tea, custard… It was really hard to choose! By the way, everyone, do you know what a shikishi is? It’s a plain piece of card that measures roughly 20cm by 20cm. Actually, because it’s quite thick – about 3mm – it might be better to call it a board. It usually has a piece of Japanese paper pasted to one side of it. In Japan, when there’s a celebratory occasion, or someone is leaving, everyone writes a message on this piece of card. At ILL, too, when someone has something to celebrate or a staff member is leaving the company, we present them with a shikishi. First of all, we write the name of the person in the middle. This time, it’s Pim. Then, so that the person we’re giving it to doesn’t see it while we’re writing on it, we put it inside the Secret File. Everyone in the office then takes it in turns to write a message along the lines of ‘Congratulations!’ or ‘See you!’ before passing the card to the next person. Of course the company president also writes a personal message. When everyone’s finished writing their messages, we decorate the card and make it cute and colorful. Finally, we give it to Pim! She seemed really pleased with it. We’re going to miss you Pim!